What gets a gardener through the dark days of winter? Thinking about spring planting of course! And what better way to get prepared for spring, than starting seeds indoors in preparation for spring planting. 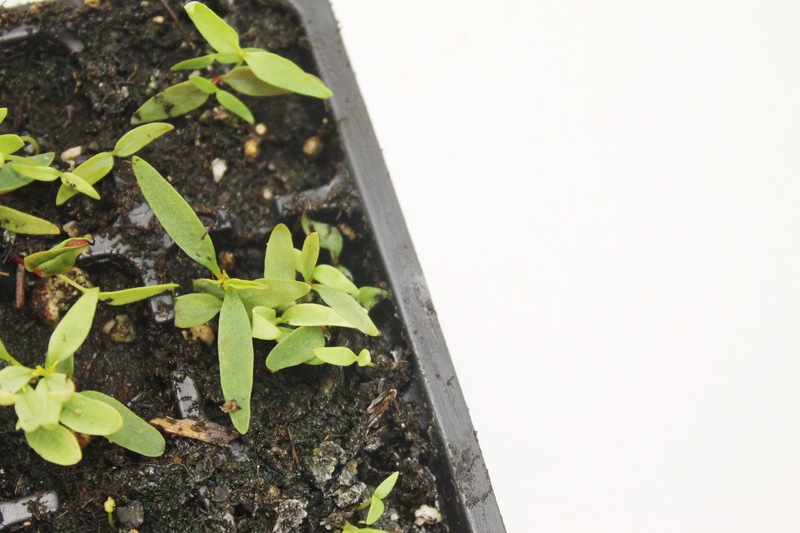 Why start your plants from seed? Because it lowers the cost you would spend buying transplants at the garden center, and it offers you a wider selection of variety options. I know you're all being bombarded with seed catalogs in the mail like I am, so you know the possibilities are almost endless with seed varieties. Starting seeds ahead of time also gives you a head start on the growing season, which is the most important benefit. Timing is essential when starting seeds in the spring, so be sure to read the back of your seed packet to find out how far ahead of the average date of last frost to get your seeds starting. When selecting seed, start with the best seed possible and use fresh seed each year for the best germination rate. If you order your seeds in advance, store them in a cool, dry place. Choose your seeds carefully for disease resistance and high quality yield. Your choice can be influenced by climate, soil, season, culture, harvest method, or intended use. Use your seed catalog to give you the best information about your particular chosen variety. There are several types of containers to choose from for your seed starting: peat pots, peat pellets, plastic pots and trays, cell flats, or paper pots. Any container you choose should provide drainage and the size should be based on the size of the transplant you'd like to produce. A larger transplant, like a tomato plant for example, may benefit from bumping up to a larger pot. The soil used for starting seeds is not actually soil at all. Use a soilless seed starting media for planting, one that consists of vermiculite, perlite, peat moss, and bark or sand. This provides better drainage and eliminates the introduction of unwanted seeds or pests. Some soil mixes contain fertilizers. If yours does, wait one to two weeks before adding additional fertilizer. Transplants will benefit from a 20-10-20 fertilizer after true leaves appear. You can grow your seedlings in a sunny window, a cold frame, a hot bed, or a greenhouse. If you can't keep your plants in a sunny area, like a Southern or Western facing window, you may need to add some supplemental lighting. Six to eight hours of sunlight a day is ideal, but if you need the supplemental lighting, keep it on for twice as long, 12-16 hours a day. Soil temperature is also very important for seed starting and you can use a thermometer to check soil temperature. For cool season crops, a soil temperature between 45 and 70 degrees is recommended while warm season crops should be at 70 to 90 degrees. Ideal air temperatures for cold season crops are 60-70 degrees daytime and 50 overnight, and for warm season crops are 70-75 degree daytime and 60 overnight. The ideal growing temperature will vary from crop to crop. After seeding, keep seeds evenly moist but don't overwater. Make sure your pots have good drainage and seeds are not sitting in water for lengths of time. To determine if the seeds need water, simply stick your finger in the soil. If it is still moist, do not add additional water just yet. Make sure you water gently to keep from damaging the seed or the seedling. Follow these tips, and you'll be all ready to transplant out to the garden as soon as warm enough weather arrives!